2 Eagle Sculpture with a front and back side of the eagle in the tree. 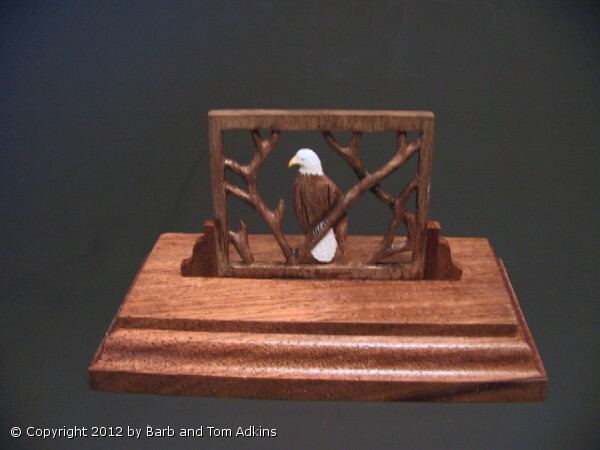 The Tranquility Eagle is a miniature sculpture of an Eagle perched in an Aspen tree above our heads. We then framed it and mounted it on the base. When a light is shined from the front of the piece, the shadow will show the silhouette of the tree branches and the eagle on the wall. The front side of the Eagle in the tree is shown here. Below is a picture of the back of the Eagle. The piece is cut from solid Black Walnut. Each section of the tree branches and the eagle were first cut with a scroll saw from one solid piece of Black walnut. The saw blade must be reinserted into each section for that section to be cut out. After the basic cuts are made, each cut section must be refined and sculpted with surgical knives. Each tree branch is fully rounded. The Eagle form must be shaped, as well as the tree branch he is sitting on. Relief cuts are made into the body of the eagle for the wings. Once it is sanded, Acrylic paint is applied to the head, body and feet to bring it to life. The sculpture has both a front and back to it. The base is Black Walnut. We have also made an Aspen Leaf shaped necklace with the Eagle inside the leaf perched on the tree branches, and Bald Eagle earrings. While in Monte Vista, CO we visited a small lake, Home Lake, where at least 2 dozen Bald Eagles had made their home for the winter. We watched several catch fish from the lake. This eagle sat, perched about 50 feet just above our heads for more than an hour, while we took picture after picture. It was such a nice serene day, I wanted to have something to remember it. We then thought it would also be a beautiful sculpture piece. We created a necklace and earrings set for me to wear. Each piece of jewelry is hand sculpted slightly differently than the other Eagles. The earrings can be either pierced or clip style. All the jewelry findings are 18kt gold plated.